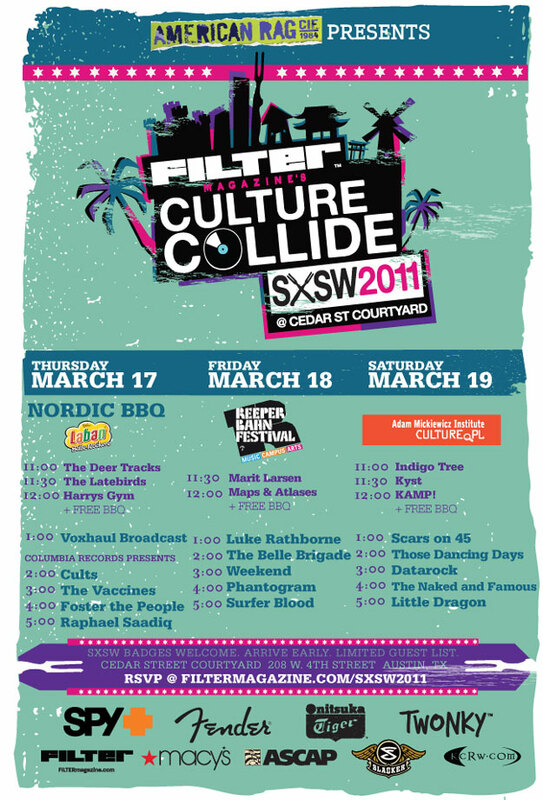 Presented by American Rag, FILTER Magazine will be hosting “Culture Collide SXSW 2011”, on March 17-19 three days jam packed with music and festivities, in Austin, TX. Check out the awesome line-up and juicy details after the jump. The party starts Thursday, March 17 kicking off with the help of Nordic BBQ and followed by six hours of live performances. Friday, March 18 is specially affiliated with Reeperbahn Festival, followed by another spectacular six hour lineup. And last but certainly not least, March 19, presented by Adam Mickiewicz Institute, features more live festivities until sundown. In addition, there will be a free BBQ lunch for all party guests from noon to 1pm. Culture Collide 2011 is happening at Cedar Street Courtyard, 208 W. 4th Street, Austin TX. To reserve your spot on the limited guest list, RSVP here. Here’s the full lineup for each day of the event.